The following is an overview of the events of 1896 in film, including a list of films released and notable births. January - In the United States, the Vitascope film projector is designed by Charles Francis Jenkins and Thomas Armat. Armat begins working with Thomas Edison to manufacture it. January 14 - Birt Acres demonstrates his film projector, the Kineopticon, the first in Britain, to the Royal Photographic Society at the Queen's Hall in London. This is the first film show to an audience in the U.K.
Robert W. Paul demonstrates his film projector, the Theatrograph (later known as the Animatograph), at the Alhambra Theatre. The Lumière Brothers first project their films in Britain, at the Empire Theatre of Varieties, Leicester Square. 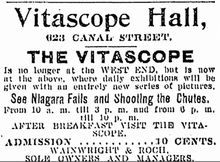 Ad for Vitascope Hall, New Orleans, offering "an entirely new series of pictures". April - Edison and Armat's Vitascope is used to project motion pictures in public screenings in New York City. May 14 - Tsar Nicholas II of Russia is crowned in Moscow, the first coronation ever recorded in film. October 19 - "Edisonia Hall" in Buffalo, New York, the first building constructed specifically for showing motion pictures. In France, magician and filmmaker Georges Méliès begins experimenting with the new motion picture technology, developing early special effect techniques, including stop motion. The Pathé Frères film company is founded. William Selig founds the Selig Polyscope Company in Chicago. Demeny-Gaumont work on a 60 mm format, first known as Biographe (unperforated), then Chronophotographe (perforated). Casimir Sivan and E. Dalphin create a 38 mm format. The first kiss ever on film is in 1896 involving the great Canadian star May Irwin and John C. Rice. The Kiss, directed by William Heise, starring May Irwin and John Rice. First kiss on film. May be considered the first romantic film. A Morning Alarm, produced by Edison Studios. ↑ "Birt Acres". EarlyCinema.com. Archived from the original on 12 July 2011. Retrieved 2011-08-15. ↑ Mast, Gerald; Kawin, Bruce F. (2007). "Birth". In Costanzo, William (ed). A Short History of the Movies (abridged 9th ed.). Pearson Education, Inc. Archived from the original on 16 July 2011. Retrieved 14 August 2011. Wikimedia Commons has media related to 1896 in film.